Location of the impact flashes detected so far by NELIOTA. The NELIOTA system consists of four main systems deployed in two remote sites, in Kryoneri and Athens. 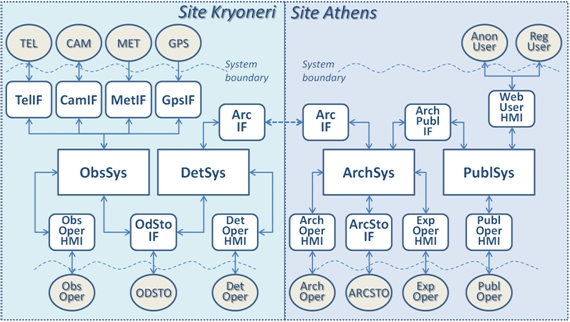 The Observation and Detection System are deployed in Kryoneri, while the Archive and Publication System are deployed in Athens. The IT hardware of the NELIOTA system satisfies the requirements of the NELIOTA operation, namely a) high-performance storage resources, in order to support the high data rate, b) high-protection storage virtualization, to ensure integrity for saving the data and c) high-performance processing resources, in order to perform the processing of large volumes of data in a reasonable amount of time. Two (2) nodes HP DL380 Gen9 Servers. 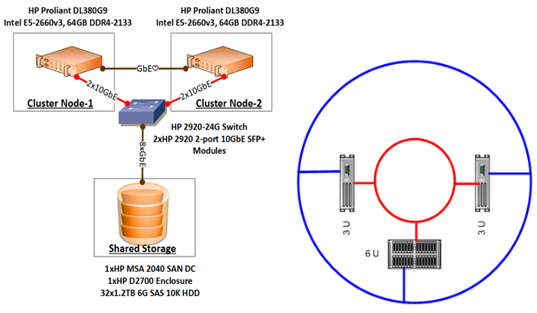 A storage Subsystem of an HP MSA 2040 SAN DC SFF Storage with an additional HP D2700 Disk Enclosure. The Storage Subsystem is populated with 32xHP 1.2TB 6GB SAS 10K SFF DP ENT HDDs, providing total RAW capacity 38.4TB. Network has been implemented in 2-ring concept. Inner (Red) Ring Network: iSCSI network. Very high speed dedicated network for data transfer between servers and MSA Storage Array. Private isolated and secured network. Outer (blue) Ring Network: Typical communication network for device management, routing configurations and remote access to devices for healthy operation monitoring. A local GPS-based NTP server is used as a time reference for all NELIOTA systems. It is characterized as a stratum 1 time server for the local network nodes (the latter could serve as stratum 2), while the remote NTP systems are in the best case stratum 2 time servers. 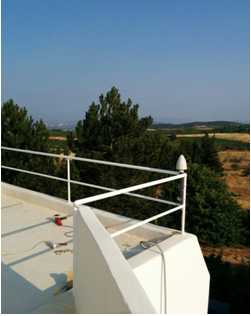 The time server and GPS antenna have been installed at the Kryoneri telescope. The general architecture of the NTP server is depicted below. Copyright © 2019 - European Space Agency - All rights Reserved.